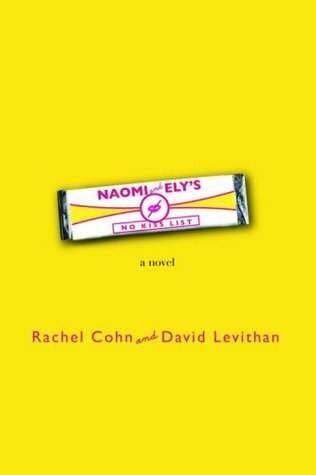 From Goodreads: "NAOMI AND ELY ARE BEST FRIENDS. Naomi loves and is in love with Ely, and Ely loves Naomi, but prefers to be in love with boys. So they create their "No Kiss List" of people neither of them is allowed to kiss. And this works fine - until Bruce. Bruce is Naomi's boyfriend, so there's no reason to put him on the List. But Ely kissed Bruce even though he is boring. The result: a rift of universal proportions and the potential end of "Naomi and Ely: the institution." Can these best friends come back together again?" Yes yes I know, this is the first book that I have given less than four stars to since starting my blog. I just didn't love this book, I wanted to, but I didn't. I have read Dash and Lily's Book of Dares and I loved it so I thought I would give this one a shot. Unfortunately it didn't live up to Dash and Lily for me. To start I got confused and thought Ely was a girl thinking you say it like El-ee, not E-lie which I guess is how it is actually pronounced? Like Eli but a different spelling? I'm not sure. Anyway I thought it was two girls, which was why Ely didn't want Naomi, because Naomi was into girls and Ely was into guys. I guess I wasn't totally wrong on that front. Turns out Ely is a guy who is into guys. And Naomi is also likes guys, more specifically Ely. Which makes things kind of difficult since Ely is gay and all. So the story is about Naomi and Ely who have been best friends and living in the same building forever. They are the kind of best friends that share everything, even clothes. Naomi knows that Ely is a guys kind of guy but she thinks it is just a phase and that in the end they will end up together and get married. I guess it doesn't help that they are always joking about where they will be getting married. Ely obviously not realising that Naomi is hoping it will actually happen. There is a lot of drama for such a short book, which isn't necessarily a bad thing. I just found that Naomi was really petty and blew everything out of proportion when things didn't go her way. She would have boyfriends but mainly just so she could use them until Ely was ready. But that plan sort of fizzles out when Ely falls in love, I don't want to spoil it for you, but this part of the story I really liked! I really don't want to spoil it though, just keep in mind I like how Ely comes across his new boyfriend! I found that there were too many points of view in this novel. Each chapter had an alternating point of view. Naomi and Ely had more designated chapters as they are the two main characters. But there were about 7 other peoples points of view throughout the story, two different Bruce's and two different Robin's so I did get more than a bit confused on occasion. Naomi's point of view used symbols in place of some words, which is a clever idea, but it slowed down my reading of her chapters as it would take longer for me to figure out what she is trying to say! So with all of that said, I did like this book, I liked the ending and most of the storyline. Though there were elements of the book that didn't float my boat, that doesn't mean that will be the same for everyone! I still enjoyed this book, just not as much as some another books that I have read. I have this book on my shelf waiting for me to pick it up and I have to say that I thought Ely was a girl too! I'm glad you cleared it cause now I'll have less confusion and a better idea of what to expect. And even though you gave it three stars I think I'm more excited to read it now then I was before because I have a much better idea of what to expect. So really, thanks for the great review!